Band saws are designed for making curved cuts in wood, but they are also ideal for resawing lumber into smaller pieces. A resaw blade can be as much as 1-inch wide, whereas the blades used for cutting curves can be as thin as 1/8-inch in width. To make the proper cuts; you'll need to install the correct blade, which means you'll need to know not only how to change the band saw blade, but also how to adjust the saw to keep the blade that you do install tracking straight and true. In the following step-by-step tutorial, learn how to change your band saw blade as well as how to make the adjustments necessary to keep your band saw blade cutting properly. The first step to changing your band saw blade is to disconnect the unit from power. The last thing you want to happen is for the unit to accidentally turn on while you're changing the blade. Once you've disconnected the power, open up the top and bottom cabinets, revealing the two tires between which the band saw blade is tightened. Clean out any excessive sawdust or chips, to make the job of changing the blade easier. Once you have the band saw cabinet opened and relatively clean of sawdust and obstructions, the next step is to loosen the blade tension. Locate the tension knob on top of the band saw, which typically is on a vertical shaft above the band saw's top cabinet. Loosen the tension on the blade by turning the knob (typically counterclockwise) until the blade is loose and pliable. Once the tension on the band saw blade is removed, and the blade is loose, the next step to changing the blade is to raise the band saw blade guard. This guard slides up and down a track and is designed to be adjusted when cutting stock of various thicknesses. The blade guard should always be in the lowest position possible without interfering with the stock, to keep the blade from deflecting. To raise the guard, turn the tightening knob found at the top of the guard on the back side of the top cabinet. Slide the guard up to the highest position, and tighten the knob to keep it secure. Once the band saw blade is loose and the front guard has been lifted, the next step in changing a band saw blade is to remove the rear blade guard. This blade guard covers the blade as it travels upwards from the bottom tire to the top tire, and protects the operator in the event of a blade breakage. To remove this blade guard, simply remove the screws that hold the blade guard in place. Typically, a Phillips screw on the top and bottom of the guard secure the guard to the chassis. Set the guard and screws aside for the time being. After removing the rear blade guard, the next step to changing a band saw blade is to loosen the under-table guard. There are typically a few blocks and adjustment wheels found underneath the table, as well as a wrap-around guard to help keep the blade in place in the event of a breakage or if the blade were to come off track. To access this blade guard, pop off the plastic center from the middle of your saw table with a screwdriver, and set this center aside. Then, look down into the hole and locate the screw that holds the protective wrap-around guard in place. Loosen the screw that holds the guard in place, then rotate the guard 180-degrees until it is out of the way. With all of the band saw blade guards removed or safely out of the way, you may now remove your band saw blade. Grab the blade near the top wheel, as shown in the image above. Pull the blade off of the two tracking tires, and rotate it 90-degrees so that the blade's teeth are pointing to your right. Guide the blade through the slot in the saw table, until it is clear of the band saw completely. Once you've removed your blade, it is a good idea to fold the band saw blade in thirds, and tie the blade together for storage. Exercise caution when folding your blade, as can spring out as you're folding, which can cause a nasty cut. After the old band saw blade is removed, you can begin installing the new band saw blade. 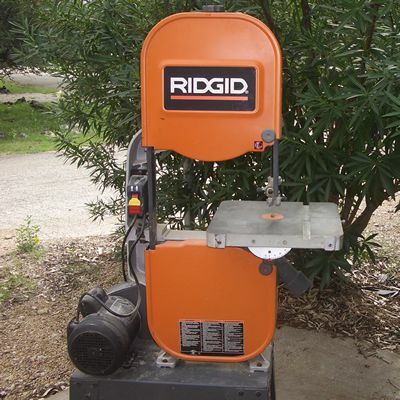 Slide the blade through the slot in the saw table in a similar manner to the way that you removed the old blade. Once the blade is through the slot and in the center cutout of the table, rotate the blade and place it over the top and bottom tire. Center the blade over the center of each of the two tires, and begin tightening the tensioning knob on the top of the band saw, to hold the blade in position. Do not over-tighten, particularly if you're going from a very small blade to a very large one, or vice-versa. Before you can begin to truly tension and adjust the tracking on your new band saw blade, you'll need to loosen the band saw guide blocks and rollers that keep the blade tracking properly. There are typically two sets of these guide blocks and rollers: one set is found in the sliding blade guard above the table, and the other set is found beneath the table. Loosen the set screw that holds the block on either side of the blade on the sliding guard above the table. The blocks should slide freely left or right, either toward or away from the blade. Then, loosen the set screw and rotate the rear roller backward, away from the rear of the blade. Repeat the step for the set of blocks and roller underneath the table. After the guide blocks and rollers are out of the way, the next step to installing a band saw blade is to apply the proper amount of tension to the blade. Check to see that the blade is tracking properly in the center of the tires, then begin tightening the tensioning knob. While tightening the tension adjustment knob, rotate the top band saw wheel, all the while watching to see that the blade tracks in the center of the tire on the wheel. If the blade is tracking too far forward or to the rear, locate the tracking adjustment knob in the back of the band saw's upper cabinet. Rotate the tracking knob slightly as you turn the wheel, and notice the difference in the centering of the blade. Keep adjusting the tracking knob until the blade rides perfectly centered on the tire. Keep in mind that a minor adjustment to the tracking knob can mean a huge difference in how the blade tracks on the tire, so make your adjustments to the tracking knob very subtle. Once the blade is tracking properly, look on the back of the saw's upper cabinet for a tensioning gauge, such as the one shown in the image above. Adjust the tension on the blade until the gauge's indicator is positioned for the proper blade thickness. A wider blade will require more tension than a thinner blade, but the indicator should have appropriate marks for every popular blade size. Once the blade is properly tensioned and tracking in the center of the tires, it is a good time to be sure that the band saw table is square to the blade. Place a combination square on the table, and align the opposite edge of the square with the side of the band saw blade. If the blade isn't perfectly square to the table, loosen the table adjustment knobs underneath the table, and adjust the angle of the table until it is square to the blade. Tighten the knobs to secure the table in position. NOTE: There are tools such as a tensioning gauge to determine the proper tension on a band saw blade. If you need this level of precision on your blade, you may wish to consider investing in one. However, for general purposes, using the gauge on the back of the saw, along with paying close attention to the results of your cuts should be sufficient for most woodworkers. With the blade properly tensioned and tracking on the center of the tires, the next step is to re-position the guide blocks and rollers. Begin by rotating the under-table blade guard back into place, and tightening the screw that secures the guard. Next, adjust the lower blocks so that they are just shy of touching each side of the blade. Tighten the set screws to hold the blocks in place. Then, adjust the forward position of the blocks so that the blocks are riding just behind the teeth, on the flat part of the blade. You may need to re-adjust the position of either block after this adjustment. Next, adjust the position of the rear roller, so that it is riding just behind the blade. Tighten all of the set screws to lock the guides in place, then rotate the wheel and watch how the band saw blade tracks through the blocks and rollers. If the blocks and rollers guide but do not touch the blade, you've positioned them correctly. Re-install the spacer in the hole in the center of the table, before moving on to the top guide blocks. Lower the blade guard about half-way toward the table, and repeat the block and roller adjustment steps that you used for the guides under the table. Also, now would be a good time to re-install the rear blade guard you removed in step 5. With the blade tracking centered on the tires while turning the wheels by hand, and with the guide blocks and rollers properly positioned, the final step to installing your new band saw blade is to plug the saw in and turn it on. Watch the tracking of the blade across the tires, and listen for binding on the guide blocks. If you see or hear any evidence of improper positioning of the guide blocks or rollers, or if the blade isn't tracking in the middle of the tire, turn off the saw, unplug it from power, and make the appropriate adjustments. If satisfied with the adjustments, close the top and bottom cabinets, lower the blade guard to the appropriate height, and commence using your band saw.